Our conch shells have been cast from actual shells found on the beach here in Myrtle Beach to which we added a color stone to enhance the detail of the shell. We can set any color gemstone (or diamond) - maybe your favorite color or birthstone - as well as your choice of 14Karat yellow or white gold or even sterling silver. The silver shells start at $35.00 without a stone, with gemstones starting at $75; the gold shells start at $225.00 without gemstones, and start at $250 w/gemstones. Our flip flops are a souvenir favorite among the tourists as well as locals. 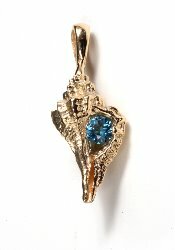 Set in 14Karat yellow gold, the opal inlay (lab-created) colors remind you of the ocean. They are available in 2 sizes or can be purchased or ordered as earrings. The small flip flop is priced at $150.00 and the larger one is $225.00.